An extract of this was pretty widely promoted, and was enough to get me hooked. The book does a good job of covering the US side of the history of atomic weapons, mixing in enough about the personal lives, and detailed reportage of a specific Titan II disaster, that it becomes hard to put down. I’d expected to find it an unsettling read, but the disconnect between the sense of US supremacy and the reality of a paranoid Strategic Air Command ends up being closer to farce. The primitive nature of the plans for first strike, the dawning realisation that even a small nuclear exchange would be impossible to de-escalate, that the US was caught between having an easy to decapitate centralised leadership, and a hair-trigger, rush to war, distributed command and control, makes you realise that we are actually luck to still be here. And, that’s before getting into the jerry-rigged nature of most of the weapons, the endless accidents with live weapons, and the false positives produced by the early warning systems. The attitude of the SAC, DoD, DoE officials feels very similar to the paranoia exhibited by the equivalents currently serving with the NSA and GCHQ. The projection of absolute knowledge that cannot be challenged without it being a show of weakness to the enemy. Not that such people need an actual enemy – even after the fall of the soviet block, both sides still maintain (only just in the case of the russians, one would imagine…) stockpiles large enough to destroy europe many times over. There is a lot of money to be made keeping us on the knife edge. Having grown up terrorised by Threads, snorts of sarcastic laughter was not what i expect from this book. We’re presumably further from the edge than when i was a kid, but that we got this far without losing a few cities along the way now seems all the more surprising. Sometime in the last few weeks (or months…) WordPress stopped working properly for me. The stats page wouldn’t load, the entry editor didn’t seem to work (the toolbar wasn’t displayed), and none of the gravatar user icon thingies were being rendered. Through a process of elimination it became obvious that Ghostery was the problem, but it wasn’t enough of a hassle to spend time understanding (yes, i’ve been posting by writing html, just like the good ole days). Today i whitelisted the Gravatar Widgets and things seem to be back to normal. 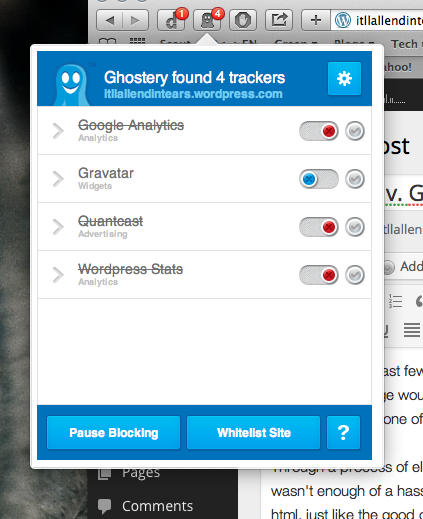 The WordPress Analytics can apparently stay blocked with no ill effects. I’d imagine that this is all documented somewhere in the WordPress forums, but finding anything up to date in there is always a horror show. This recipe is deeply unoriginal, but i’ve been making it quite a bit recently, and thought it would be good to write down. Put the chilli and a small amount of vegetable oil in a cold saucepan, and turn on the heat. When the oil is hot add the onion and cook for 5 minutes, add the salt to taste when the onions are getting soft. Add the garlic and ginger, roughly chopped, then the coriander powder. Let this mixture cook for a couple of minutes, being careful that it doesn’t burn (keep it moving). Then throw in the peeled, de-seeded, chopped squash, and cover with water. Add salt as necessary. Simmer for 15 – 20 minutes, and then puree with a hand blender. Add water to adjust the consistency (it tends to end up pretty thick). Eat it with toasted pumpkin seeds, and proper german dark bread. The end result is pretty spicy (from both the chilli and the ginger) and just the thing at the start of winter when you can still get relatively fresh, hard, butternut squash. It’s an 800+ page shaggy dog story. The sort of thing that you end up reading in a day, with periodic pauses for sleep. Not really sure what else there is to say. It’s well written, engaging, and to a large degree entertaining, but at the end of the day nothing about it is life changing / groundbreaking. Let it be said that there is obviously another level of understanding / structure available here to anyone who has an interest in astrology. I can’t really say how much said understanding would add to the reading, only that being vaguely aware of it didn’t seem to detract. Meh out of 10, wouldn’t purposefully go out and buy more of her books. The MacPro woes have gradually subsided, but a few things were weird, and it was bothering me that i’d never really got to the bottom of the problem. The weirdness was that privoxy wasn’t always starting at login (meaning i’d have to start it manually most days), clicking on a Java jar packaged application in the Finder was creating an archive instead of launching (meaning i’d have to start it from the command line with java -jar), and a bunch of application associations felt like they were missing. Consequently i’ve been watching the system.log and trying to clean up the mess at startup / login. Don’t know if all OS X systems are like this but this one, which has run every O/S release and patch from 2007 until now, but it is a mess at startup. There is some stuff, such as ‘locationd’ that always logs an exception (because the machine doesn’t have a wireless card…) and a host of old agents / daemons controlled by ‘launchd’ that reference files or packages that no longer exist, use outdated plist syntax, etc. In short, it’s a mess. lsregister: LaunchServices database store corruption detected. the startup / login time are noticeably improved, even application start times might be a little improved. The moral of this story? Not really sure… maybe that periodic clean installs are as important on OS X as they are on Windows, but with the period measured in years rather than months. Edit: Having got the bit between my teeth, i’ve been back and cleaned up a bunch of the messages in the system.log and kernel.log. Removing a bunch third party kernel extensions (PACE, VirtualBox, Cisco VPN, BRESinkx86, etc.) that have accumulated over the years. The output of ‘kextstat’ now contains no non-apple kernel extentions. Yay! We were out in Feldstraße on Friday night for a slap-up falafel dinner at my current favourite turkish imbiss (Emmioglu). On the short walk from the station we’d noticed some full length portraits hanging in the window of the ice cream shop, and remarked that they looked like the work of a photographer in residence at Vorwerkstift (the place where i have access to a darkroom). Didn’t think much more of it until after we’d eaten. Maurice and Bjoern working the people! Not sure if it’s allowed to use the term carny… it’s probably an americanism i’ve picked up from Nick Cave. Anyway, it was lovely to catch up with Maurice for a while… really should get him out for a beer and some storytelling soon. There are another couple of days to drop by and see the show, and you should! Hallucination is a fascinating subject. Like most people (i presume…) my experiences with the phenomena is limited. At best i could lay claim to having heard a few things that weren’t really there on the borders of sleep, or in prolonged periods of unnatural silence, and to have seen geometric patterns at the onset of migraine (or migraine-like) headaches, but full-blown, waking state visions of things that simply aren’t there? No, that just hasn’t been in my direct experience. Consequently i’m drawn to reading about these experiences, both the first hand accounts of Sack’s own drug experimentation, and those related to him by his patients. There is a tendency for tales of drug use to get carried away in the deeper meanings (Huxley was prone to this in his writings on the subject, see Heaven & Hell, and The Doors of Perception, even while he obviously tried to be analytical on the subject), but Sacks manages to keep things on the “straight and narrow” by focusing on physiological causes and background. Especially in the case of naturally or disease caused hallucination events this gives good insight into the limited understanding of the brain that we can attain with the functional area mapping that it has been possible to build with fMRI. Sack’s telling of his patients stories always comes across with great deal of humility and understanding for the experiences (often horrors!) that they are living through. Like V.S. Ramachandran’s Phantoms of the Brain, you are never left with the feeling that this is mawkish intrusion into a life. During a period in which i was particularly unhappy at school, somewhere between the ages of eight and ten, i started having a recurring nightmare (nightmare is an abused term, so i should probably say, “bad dream”). From the outset this dream was both very simple, and extremely rich in sensory input. I’d be standing on a cliff top, and be struck with a sense of vertigo. Then i’d find myself falling, but doing so agonizingly slowly. At this point the overwhelming sensation would be one of texture, specifically the stringy texture of what i believe is called ‘braising steak’, in the form that it had been slow cooked in something like a casserole. This sensation was also present as either a smell or a taste. As far as i recall this combination of falling and texture was enough to wake me up in confusion. The dream would replay, with no variation, when i fell back asleep, would reoccur on a nightly basis, and eventually intrude into waking consciousness. When this happened during the day, it did so without the visual aspects, but the sensations would feel real enough to make me nauseous and panicked. It went on for months, and got to the point that i tried to explain it to my mother (would be interesting to ask her if she recalls any of this!) Eventually the dream stopped being so regular, returning only infrequently until my teens, when it stopped. There are hallucinations of many senses, in different states of consciousness, and i wonder whether this intrusion of my dream state into my waking state was actually my own experience with a hallucinatory episode. Well, that got a little odd, but always wanted to explain what that “falling through stewing steak” up there was all about… Another good book you should read!